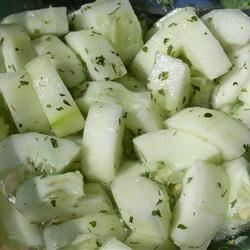 "This is a perfect side dish for your summer barbecue or any Mediterranean or Middle Eastern dish. You can also substitute 2 large tomatoes for the cucumber for a delicious tomato salad." My great Grandmother made something similar. It's just the vinigar, sugar, salt, cucumbers + tomato and white onion. Let it set over night. It's so refreshing I can't stop eating it. I added chopped sweet onion and apple cider vinegar at a 1 to 3 ratio with the white vinegar. It was a hit! I was a little nervous to try this since I've never had anything like it before, but it was DELICIOUS! :) I'll definitely be making it again! Thanks!! !